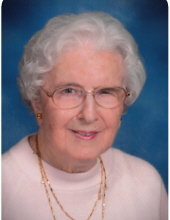 Catherine L. Brown, 95, of Middletown, died Friday, March 22, 2019, at Ohio Living Mt. Pleasant. She was born in London, Ohio on June 14, 1923 to parents Stewart W. and Lula (Stevens) Edwards. Catherine had worked as an executive secretary for Sorg Paper Company. She was an active member of First United Methodist Church until her health made her slow down. Mrs. Brown is survived by her sister, Myra S. Edwards; and numerous nieces, nephews, great nieces, great nephews, great great nieces & great great nephews. She was preceded in death by her husband, Robert E. Brown; parents and several siblings. Funeral Service will be held Thursday, March 28, 2019 at 11:00 am at Wilson-Schramm-Spaulding Funeral Home, 3805 Roosevelt Blvd., Middletown with Reverend John Wagner officiating. Visitation will be prior to the service from 10:00 - 11:00 am. Interment will be at Woodside Cemetery. To send flowers or a remembrance gift to the family of Catherine L. Brown, please visit our Tribute Store. "Email Address" would like to share the life celebration of Catherine L. Brown. Click on the "link" to go to share a favorite memory or leave a condolence message for the family.